(Natural News) Acute pancreatitis can be treated with Chinese ginseng (Panax notoginseng) according to a study published in the journal BMC Complementary and Alternative Medicine. Researchers from Kunming Medical University and its affiliated hospitals in Kunming, China looked at the protective effects of Chinese ginseng extracts against acute pancreatitis. In conducting the study, they first gave Chinese ginseng extract to mice by intravenous injection. After two hours, they administered taurocholate to induce severe acute pancreatitis. The next day, they measured the expression levels of miR-181b, microtubule-associated protein II light chain 3 (LC3-II), myosin-like B-cell lymphoma 2 (Blc-2) interacting protein (Beclin1), protein kinase B (Akt), and mammalian target of rapamycin (mTOR) signaling pathways involved in the regulation of autophagy, which indicates the development of pancreatitis. The research team also measured the expression levels of Caspase-3 and Blc-2 and amylase and lipase levels. In addition, they assessed apoptosis and conducted a histological analysis. The results of the study revealed that Chinese ginseng increased the miR-181b expression level, which led to a significant reduction of pancreatic injury and autophagy and increases in apoptosis. It also prevented the formation of autophagosomes. The formation of autophagosomes plays a role in the development of pancreatitis and Chinese ginseng extract inhibited this. In addition, the treatment improved pancreatitis by reducing autophagy activation via increasing the mTOR/Akt pathway. It also reduced Bcl-2 expression, blocked autophagosome markers Beclin1 and LC3-11, and enhanced Caspase-3 expression. Moreover, the Chinese ginseng extract substantially reduced lipase and amylase levels. Chinese ginseng is used in traditional Chinese medicine in treating various diseases. Chinese ginseng is also referred to as San Qi, which means “Three Seven.” The name comes from the belief that the herb is more effective when harvested between three and seven years after planting. 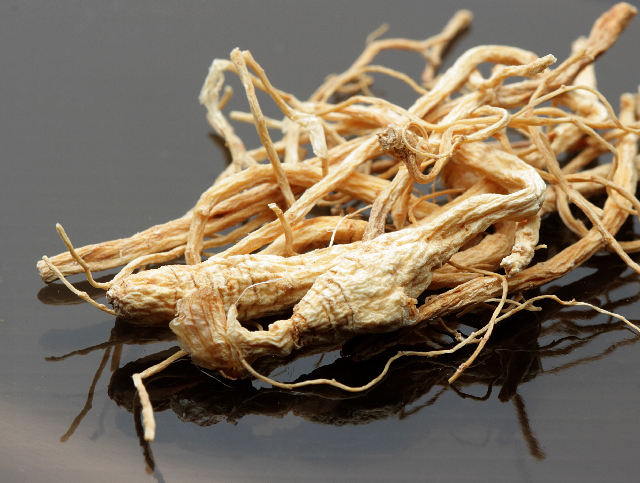 It is said that the best quality Chinese ginseng is grown in southern China. Wenshan in Yunnan province and Jingxi in the province of Guanxi have moderate temperatures and enough rainfall to grow the finest Chinese ginseng. Chinese ginseng can relieve pain: In traditional Chinese medicine, poor blood circulation may be the cause of aches and pains. Chinese ginseng is said to improve blood flow, thereby relieving pain. Chinese ginseng helps stop bleeding: Chinese ginseng is widely used in traditional Chinese medicine to treat traumatic injuries and different kinds of bleeding. It can be used to make a drink that promotes the healing of small scrapes and cuts. Chinese ginseng may help in growth and development: Chinese ginseng is also believed to promote the growth of children during puberty. This may be due to its ability to promote circulation and prevent blood stasis, which in turn, improves the flow of nutrients to the bones and body. Chinese ginseng is a remedy for women after giving birth: This herb can be helpful to women who have given birth, because of its ability to inhibit excessive bleeding and postnatal discharge. However, it should not be used in the middle of pregnancy. Chinese ginseng is good for the heart: This herb can lower cholesterol levels. According to studies, Chinese ginseng can help lessen chest pain caused by coronary heart disease. Read more news stories and studies on natural treatments for pancreatitis by going to ChineseMedicine.news.